Slingshot Racing is a great new iPhone and iPad racing game by Crescent Games with a few interesting turns you don't see every day. For one, it's a luge racing game, which is a refreshing change of scenery after scores of car racers available. 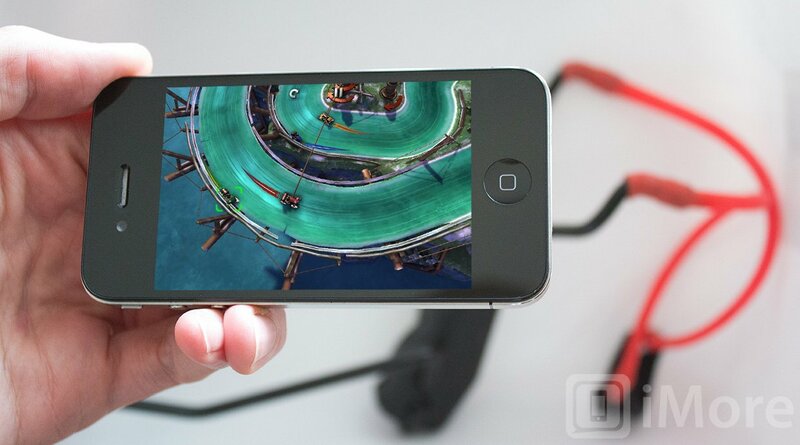 Secondly, Slingshot Racing features fluid, precise, and surprisingly fun one-touch controls. See, every corner has a turnstile off the track which just spins continuously. As you approach, you hold down your finger on the screen, and your little racer harpoons to it, enabling you to slingshot around the corner and gain momentum. You have to be sure to release your touch at the right moment though, otherwise you'll just smash right into the inside wall. Slingshot Racing features the usual spread of game types, including time trial, item collecting, competitive grand prix, as well as local multiplayer. There are 16 tours with 4 challenges each across 8 different tracks, all littered with a variety of power-ups and obstacles Each race is scored out of three bolt nuts, depending on how you place; new events are unlocked the more nuts you have, though you can go ahead and unlock all of them for $1.99. Game Support exists for leaderboard and achievement tracking, but it would be really nice to see Slingshot Racing get online multiplayer up and running. It would be nice to have ghost bobsleds on the course replaying your friends' top result when you're trying to beat them, but that might be asking for a little much. iCloud saving is active, which is great considering Slingshot Racing really excels at local multiplayer on the iPad's big screen. I've had some issues getting my cloud sync to work, but it's on the feature list so I'll chalk it up to an isolated incident. The game is also universal, so you only have to buy it once to enjoy it on both your iPhone and iPad. 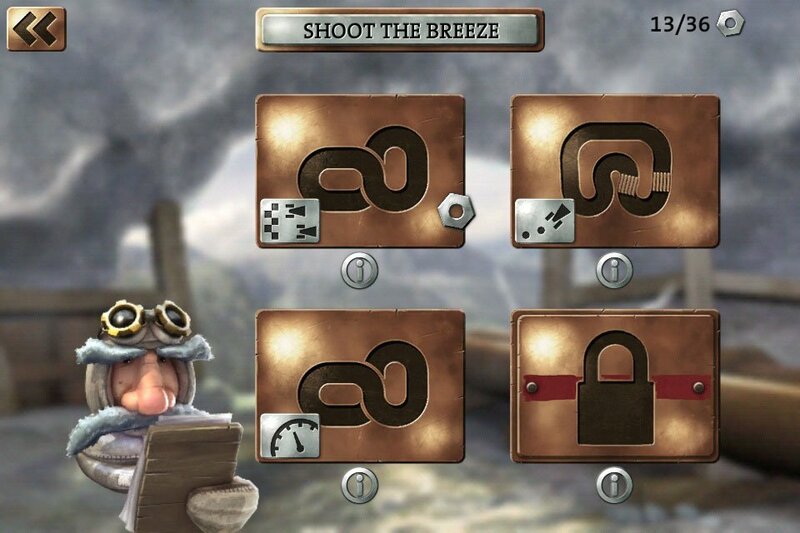 The graphics are polished and playful, with a distinctive steampunk feel. Textures and models are fully optimized for the new iPad's Retina display, which makes for a particularly sharp and smooth experience. The sound is equally nice, and includes fine details like the scratching of ice as you round a corner and the rickety jostling of grinding against your competitors. There's a decent variety of music, so there's nothing too mind-numbingly repetitive except for maybe the main menu screen. I'm a huge fan of Slingshot Racing, though I'm finding its accolades for originality are a little steep as the gameplay is very similar to a free abstract action game released last year called Orbit1. Much like Orbit1 (and Beat Sneak Bandit, for that matter), it can certainly get a little repetitive using the exact same mechanic over and over, even if getting your timing down is still a significant challenge. Slingshot Racing still gets major points for applying the inertia formula to the racing genre and adding some top-notch graphics to the mix. It would be nice to see some added customizability aside from paint jobs and the handful of different chassis linked to them; I know it's hard to offer a lot of variety considering there's no acceleration or handling ratings you could adjust like in normal racing games, but maybe weight categories could differentiate how fast you come off of a slingshot, how much speed you lose after an impact, and how well you can handle impact with other racers or walls. 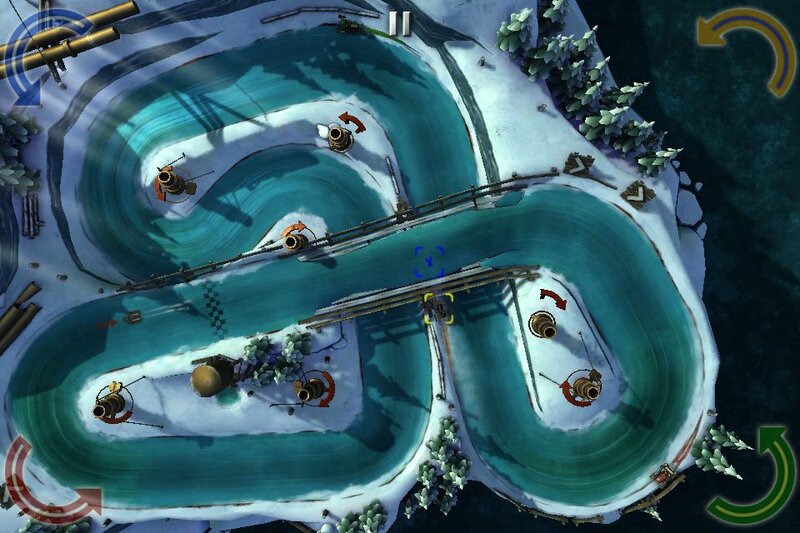 If you're bored of the same ol' racing games, Slingshot Racing is a breath of fresh, crisp, wintery air. Grab it now while it's on sale!